Real Madrid are ready to stun the football world by putting Cristiano Ronaldo up for sale for a staggering £150million. Sportsmail understands a major rift has developed between the star Portuguese forward and Madrid manager Jose Mourinho following a training-ground row, and club president Florentino Perez is reluctantly willing to listen to offers. Madrid paid a world-record fee of £80m to Manchester United in 2009 and Perez has said he would want to make a significant profit to appease the supporters for the sale of their best player. Ronaldo, after all, was seen as Madrid's answer to the dominance of Barcelona. While there would be numerous suitors for his signature, even top clubs will balk at the astronomical fee and the player's wages. At Madrid he commands a salary of 20m euros a year, leaving him with 12m euros net - more than £200,000 a week. It might take a net weekly wage in excess of £300,000 to prise him away from Spain. Manchester City, whose Abu Dhabi owners could easily afford the world-record sum demanded, have declared they do not plan a summer transfer splurge, leaving the former United player's options decidedly limited. 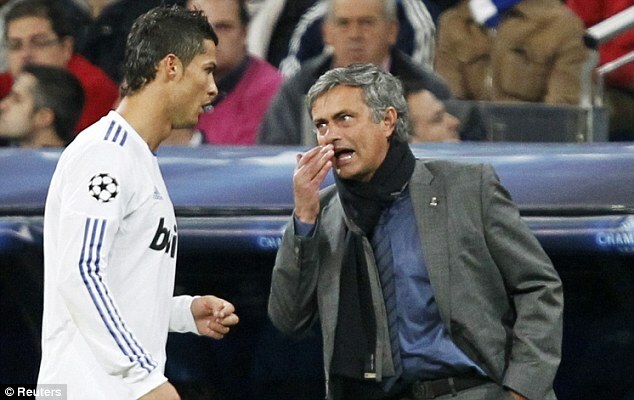 There have been issues between Ronaldo and Mourinho in the past and the relationship between the two seems to have broken down after a disagreement over the former Chelsea boss's tactics for the Champions League semi-final against Barcelona. The Portugal winger said of Mourinho's system: 'I don't like it, but I have to adapt because that is the way it is.' The winger was then dropped for Madrid's next game against Zaragoza. Ronaldo, who has scored an astonishing 38 goals in La Liga this season, courted a move to the Santiago Bernabeu throughout the final year of his time in England. His goalscoring exploits in two leagues have turned him into a worldwide icon. However, Madrid may have to lower their asking price to attract any serious suitors unless, of course, Manchester City change their spending plans - or are forced to do so if they lose their talismanic Argentinian captain Carlos Tevez. Tevez's future at the club is in the balance. Manager Roberto Mancini has suggested he will stay, but Tevez has expressed a desire to be closer to his children, who live in South America. Put this on a thread because i was just talking to my mate (fellow Chelsea fan) who wants us to make a bid if this does happen, i on the other hand would just rather save £120m and get Neymar, who is 7 years younger and will turn out better. Just curious as to what my fellow Blues think about this? We don't want gays in our team. Why? What have they done to you or your loved ones? I don't believe in this story. £150 million can buy you a whole world class team. Soory mate, 'we' only means 'you' in this case. Sexual orientation doesn't matter as long as they provide a talent football-wise to the team (Like Neymar) , or are willing to do anything for the club (Like Kalou and his work-rate). We can get: Neymar, Aguero, Montolivo, VDW, Courtois, AND Lukaku for that money lol. Seriously though, IF this story is real (which i highly doubt) i would prefer we spend the money on multiple players, instead of just 1. Are you defending them?Hope you aren't one of them. I hate everyone player who is playing or ever played in manchester united.I don't think that only for Gigs. Its not We. Its City. Incredible that writers get paid good money to produce that dross. With this money, Chelsea could buy the entire FC Porto team, or the entire Romanian Championship, probably. Nobody will ever pay 150 million for a football player. However, if that happens, it would be a sign that the apocalipse is really coming. They are Real Madrid, but they aren't crazy, CR is their best player. Complete crap story, something which is not going to happen. Ronaldo is RM prize asset at the moment who is hitting goals and breaking records for fun, RM would get anyone better than him. It is like Ronaldo paying Madrid off his 80 M in goals. If there is any truth to this, it would be Jose who goes out and not Ronaldo. And anyways i hate him, A CERTIFIED Cheater! and an arrogant Jerk, not needed. We have has been a team which always believes in "we" (well mostly) dont want him to come in and everything becoming "Me"
I've a feeling Madrid would rather rid of Mourinho than their much-beloved asset in Ronaldo. He's a fan-favourite, get's them 50+ goals a season and his shirt sales must be astronomical! Mourinho on the other hand has apparently 'ruined their image' (according to some)..
As for us getting him... I agree with getting Neymar instead! Have you lads forgotten this little story? 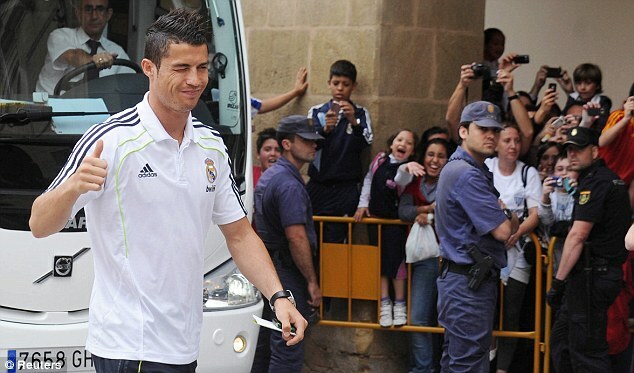 I can think of 2 clubs now who would bid for CR, but RM is not going to sell him.